To provide periodic, short-term introductory through advanced leadership training. The teachers are carefully selected from the gifted and seasoned servants of God and the class size is kept small. The content of training focuses on the three crucial aspects of spiritual leadership: character formation, biblical knowledge and leadership skills. 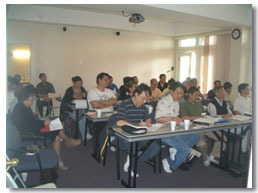 The latest teaching and learning equipment as well as a multimedia resource center with a concentration on leadership and church growth materials are provided on site for the teachers and students. To provide fellowship programs to church leaders in an environment designed to promote open and disciplined sharing of each other’s burdens as well as ministry insights. Church leaders from the same or different churches with diverse perspectives, denominations or backgrounds can get acquainted, share and pray together for mutual edification and support. The goal is to tear down the barriers and build up the kind of biblical unity and love among church leaders, which Christ prayed for and commanded. To provide suitable facilities and a conducive environment so that church leaders can spend a period of time for personal renewal by way of spiritual retreat and disciplines such as prayer, meditation and reflection.